Rio Salado President Chris Bustamante will be taking part in a discussion with PBS NewsHour / Education Week Correspondent Kavitha Cardoza about making higher education affordable and responsive for more students on Oct. 30 at the National Press Club in Washington, D.C.
Bustamante and Cardoza will be joined by a panel, which includes students, to talk about the evolving needs and demographics of today’s students by addressing these questions: What realities do adult learners and other non-traditional students face? What are the innovative models needed to serve them better? 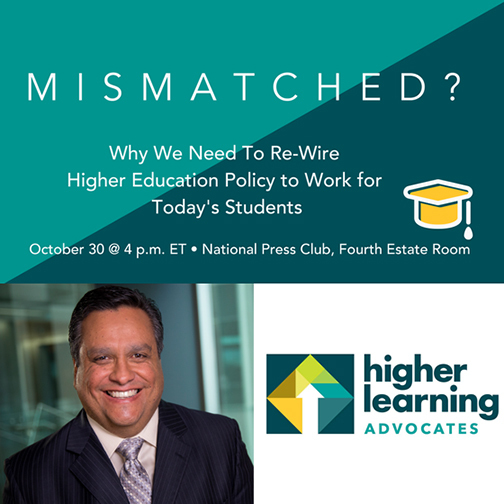 How can federal policy catch up to better support them in the process of accessing and financing higher learning?